Truddabellz Creations: Christmas in June? Can it ever be too early to start on Christmas cards? Lol. I can't help loving some my Christmas stamps and every now and then I find myself rummaging through the Christmas stuff. 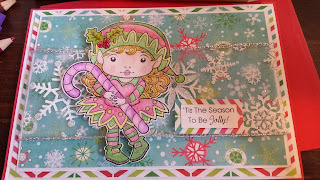 Of course, I could not leave well enough alone and had to stamp and color me up a cutie from my Christmas stash, right?? Lol. Hopefully this strong urge to go through my Christmas stuff this early in the year will make me look extremely organized and on top of things. Hee hee hee with a wink. Most of my family and friends will be rolling around and laughing hard and saying Yeah Right/ Dream On! Red cardstock and design papers of background are from Recollections. Sheer Christmas Ribbon with Snowflakes is toward middle of the layered design paper for an additional layer. 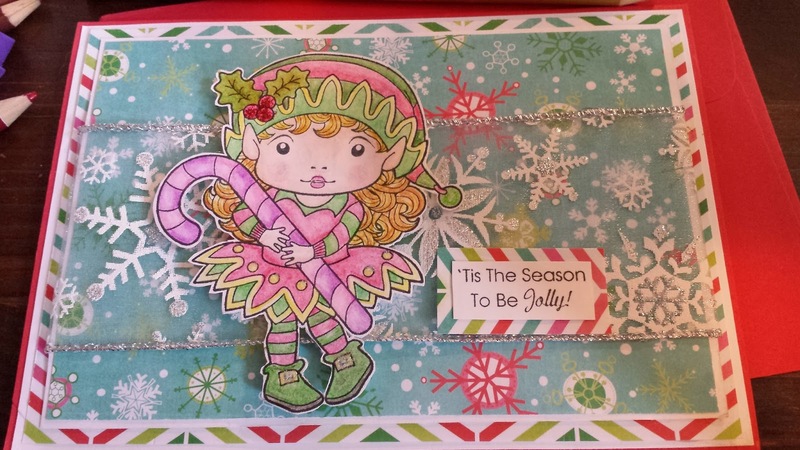 Stamp is La La Land Crafts' Christmas Elf Marci which has been colored with colored pencils and topped off with a bit of glitter glue for a slight bling effect. Sentiment is also from La La Land Crafts. Thanks so much for stopping in to view the newest of my creations. I hope you have a happy and scrappy day!